Foucault and the Government of Disability. Edited by Shelley Lynn Tremain. University of Michigan Press, 2005. Softcover, 362 pages. $27.95. Michel Foucault (sounds like m'SHELL fooCOE) was a French philosopher who lived from 1926 to 1984 and who dealt with issues like the way power works invisibly in everyday life and how things are assumed to be "natural," "obvious," and "always true." Although he is not an uncontroversial figure, some people working on disability issues have found his work useful. This is the third essay in Cal Montgomery's 3-part series on Medicalization. I recently received a flyer inviting me to the annual meeting of a local center for independent living (sometimes called a "CIL"). Under "Access Accommodations" is the information that it will be held in a location that is inaccessible to me because of the fluorescent lighting. Philosopher Michel Foucault says: look at what we take for granted. See that it is in no way inevitable. And that's a good way of analyzing the disability situation. There are places at which it could have been held that are -- to the best of my knowledge -- accessible to everyone whose access needs were met by the chosen location and also a large number of us with atypical neurologies for whom fluorescent lights are a barrier. Holding the meeting in, say, the CIL's own meeting room, which the executive director says has been made fluorescent-free, would cost the same amount of money or less. This was something I fought for unsuccessfully when I worked there. After I quit, another employee made the same request and was provided reasonable accommodation. But if I asked the executive director why disability access is not a priority at the CIL, she probably wouldn't know what I was talking about. Of course disability access is their top priority. After all, when they send employees who walk out to pick up lunch for the whole crew, those employees are forbidden to patronize take-out places that still have steps at their doors. Last year they even made a special deal with paratransit providers to ensure that nobody would be refused a ride to the annual meeting. Two years ago when I asked that the travel training team post directions on how to get from the nearby subway station to the meeting, they refused on the grounds that they could not possibly predict everybody's travel needs and they refused to provide a service that might not be accessible to some people. Plus, it's a CIL, right? And CILs are groups with white hats when it comes to disability rights. So if they're not willing to provide me with basic access, then my access needs are outside the sphere of disability rights. Right? Michel Foucault was a 20th-century French philosopher who wrote such works as The Birth of the Clinic and Discipline and Punish and whose work is widely discussed by those disability studies workers who work in the humanities. In the 20th century, Western philosophy was largely divided into two broad strands. Foucault and his followers come from one, and I have always been much better at reading the other. I still frequently struggle to figure out what he and his followers are getting at. In fact, I'd class myself as a beginner when it comes to Foucauldian theory. On the other hand, I've read and enjoyed books like The Social Construction of Reality, The Construction of Social Reality, and The Social Construction of What? -- and I do think I have a basic grasp of some of Foucault's insights. I want to better understand Foucault's ideas about the ways that the things we take for granted as natural and inevitable have actually developed. Sometimes I just don't get how it is that disability rights, independent living, and disability studies workers seem to regard discrimination against some disabled people as anathema and discrimination against others as almost obligatory. In fairness, though, I think it altogether likely that some of my fundamental beliefs about how the world works and how it ought to work are someday going to be challenged by another activist who sees my ablist assumptions clearly. After all, I live 24 hours a day in an ablist world; it's hard to do that without absorbing some of the ablism. I was assured that Foucault and the Government of Disability would be a good book for a beginner. I know several people who would probably consider it light reading even though they've found The Social Construction of What? impenetrable. But for this beginner, Foucault was slow going. There were moments when I really found myself enjoying the book. Anne Waldschmidt's essay on normality, deviance, and genetic counseling has a discussion about the way genetic risks can be presented that parallels a discussion in Ray Moynihan's and Alan Cassel's book Selling Sickness on the presentation of high blood pressure and its associated risks, and once I made that connection a great deal of Waldschmidt's argument became clearer to me. Moreover my understanding of specific bits of Foucauldian jargon has gotten better as I've read, and for the first time I'm starting to believe that if I ever actually stuck to a couple of weeks of Foucault immersion around the clock, I might emerge at the end able to engage a friendly Foucauldian in discussion and understand what we were saying. Most of us have probably never seriously questioned all of our beliefs. But because the way things are is unjust, and because that injustice is masked by a belief that our disadvantages are individual medical problems, we have a long way to go before we root out the ablism in our society. And I've begun to get a sense of the discussions within the community of Foucault scholars. Foucault's work has always seemed to me to be very pessimistic; but where Bill Hughes offers "a corrective" from outside Foucault's work, Julie Allan argues that most people worried about that pessimism have simply been looking in the wrong places. The effort involved in reading Foucault and the Government of Disability, then, has been well spent. I am making progress toward understanding what I believe is an important discussion within disability studies that can help us with disability rights work. Why do I believe that Foucault's work, and the work of those who build on what he wrote, can help us with disability rights work? Because an important theme in Foucauldian work is looking at what we take for granted, and seeing how it is in no way inevitable. Consider this: disabled people are disadvantaged within society. That disadvantage is believed by most members of that society to be a natural consequence of individual physical and mental deficits which are properly considered medical problems. I believe that it is valuable to challenge our beliefs about the causes of our disadvantage. If -- as the members of the Union of the Physically Impaired Against Segregation (UPIAS) said thirty years ago -- we go around challenging the various manifestations of the problem (such as unemployment, poverty, and isolation) without understanding and addressing the very core of the problem, I do not believe we will be successful. We have to be able to question the taken-for-granted medical model of disability, and the medical models of our various impairments. And while I believe that the social-modellers who built on this basic insight of UPIAS's have a lot to offer us as we do this, I believe that the Foucauldians have a lot to offer us as well. Most of us have come to see some of the disadvantage linked to certain diagnostic categories as either clearly "medical" in nature and other disadvantage as clearly "non-medical". We attribute some disadvantages to society's unjust practices and others to the physical and mental "defects" we identify in some people. We struggle to address the social disadvantages by fighting for rights while we address the individual disadvantages by supporting research into treatments and cures. Autistic filmmaker Sue Rubin thinks that many of the disadvantages she has had to deal with in her life are caused by autism and that the only solution for it would be a cure. I don't believe that there is such a thing as "autism" in the first place (though I'm sloppy sometimes in my usage) and that while I cannot control many of the ways I differ from the stereotypical neurotypical (I spent decades trying and failing), I believe that those differences neither cause nor justify the pattern of disadvantages I deal with as I try to be a member of society. The social-modellers have historically distinguished between impairment (which they believe to be medical) and disability (which they define as "something imposed on top of our impairments, by the way we are unnecessarily isolated and excluded from full participation in society"). This way of thinking allows them to address ablist injustice ("disability") completely separately from any sort of medical issue. 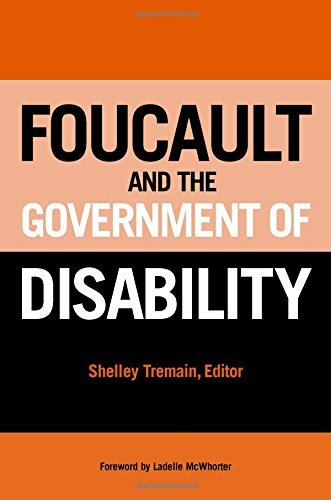 Shelley Tremain, the editor of Foucault and the Government of Disability, was the one who convinced me that if we accept the social-model split it will turn out that impairment is a social construction that depends on disability. It's not that she believes that everyone has the same abilities as everyone else and the labels are limiting people, but rather that you cannot make sense of impairment without having a sense of disability. Many Foucauldians see their work as going beyond what the social model has to offer and thus making it obsolete, while social-modellers continue to regard their tradition as vibrant. The proponents of the Americans with Disabilities Act definition, on the other hand, allow that it is physical and mental impairment that substantially limits disabled people's lives, except in cases of nondisabled people believed to be and treated as disabled. Many of them -- and I strongly disagree because of that allowance -- also believe that the ADA is a step away from the medical model. Catherine Scott, Ray Moynihan, and Alan Cassels believe that a great many people to whom medical-pharmaceutical "fixes" are being marketed don't actually have medical problems that warrant pharmaceutical intervention; and that a great many other people who aren't getting pharmaceutical intervention -- people with HIV and/or AIDS in Africa, being a particularly disturbing example -- do have medical problems that should be dealt with pharmaceutically. Some of us believe that "high-functioning people" or "the invisibly disabled" or "people who only use wheelchairs" don't face any real disadvantage and therefore don't need either cures or rights; some of us believe that "low-functioning people" or "mentally retarded people" are disadvantaged by medical conditions alone and therefore aren't the concern of the disability rights movement; some of us believe that alcoholics drink for moral and not medical reasons and others believe exactly the opposite; and most of us have probably never seriously questioned all of our beliefs along these lines. The way the "cross-disability" sections of the disability rights and the independent living movements are dominated by certain categories of disabled people seems natural to many people, but it could have gone another way. The movements have come to believe that it's important to get wheelchairs into classrooms and jobsites and housing and CILs that are built to accommodate them. They haven't come to believe that it's important to do the same thing for people who can't manage under fluorescent lights. But it could have gone differently. Imagine for a moment that the disability rights movement had not arisen during a time when there were not so many white-collar jobs in America, but rather during a time when the majority of us were expected to do physical labor. In such a time, with an "able body" being more important than an "able mind" it's entirely possible that people with cognitive impairments might have come to be the paradigmatic disabled people around whose needs the whole thing was organized. After all, our physical accomplishments would have a whole lot more to do with our places in society than our cognitive accomplishments. We might have come to see a fluorescent-infested environment as unjust earlier than we grasped the injustice of stair-infestedness, and my local CIL might have mentioned, under "Access Accommodations," that the annual meeting would be held on the second floor of a building with no elevators. Sometimes it seems as if the way things are is the only way they could be. For those of us in the USA this appearance is heightened by the one-way nature of much of our communication with the world. We are exporting more culture than we are importing, and the result is that we do not have many people to tell us about ways that things could be different. But they could. We'll probably never get all the way to true universal design in both the built and the social environment, but we can try. We'll probably never get to eradicate all our own unconscious ablism, but we can try. And because the way things are is unjust and because that injustice is masked by a belief that our disadvantages are individual medical problems, we have a long way to go before we root out the ablism in our society. And even if we don't succeed in my lifetime or yours, we can still know that we helped to make the way things are closer to the way things ought to be. In good conscience, I have to admit that Foucault and the Government of Disability is not a book that I would recommend to many of my friends. Those people who can follow Foucault's work, yes; and those people who are willing to put in the effort that it would take to understand that work, yes. But not the majority of them. At the same time, I believe that it is an important book, and I strongly recommend it to those of our activists who are willing to do all the background work And you can bet that during or after my Foucault Immersion times out, I will be reading it again. Cal Montgomery is kind of geeky, as you can tell from this book review. (You should feel free to substitute "impossibly" for "kind of" if you like.) She writes for Ragged Edge, and she will not be attending any annual meetings of any CILs this year. No doubt the people at the CILs are as thrilled as Cal. She will use the time she could have spent attending annual meetings for, as her mother used to say in a scandalized voice, "reading BOOKS!"